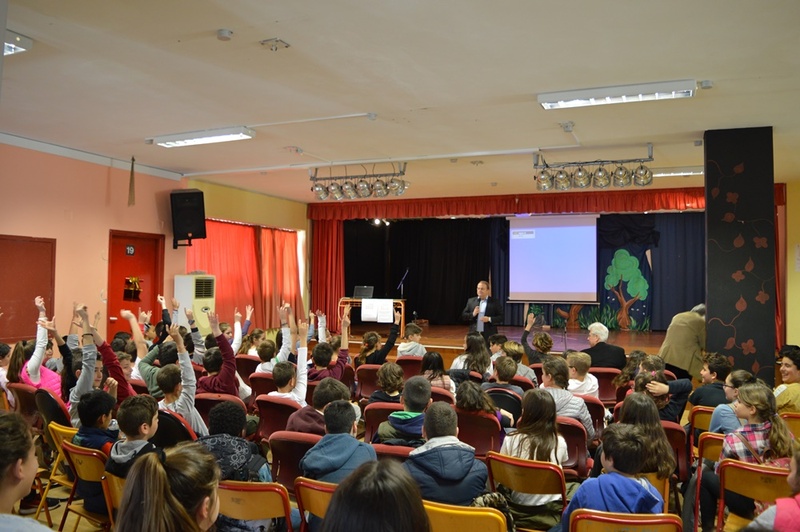 Pupils of 2 elementary schools in Vari Voula Vouliagmeni were informed, during a special event, on the subjects of recycling and the production of soil improvers (compost), on the 15 March 2018. The Mayor of Vari Voula Vouliagmeni Grigoris Konstantellos, stressed the importance of recycling to the young students as well as the how it contribute to sustainability and cyclical economy. He explained how land filling destroys the environment and he stressed how all the citizens can contribute to the effort to change this. After the Mayor, the director of the Municipal waste disposal department, Mr Miltiadis Kavrakos explained the correct procedures and the ways we can separate the garbage in order to dispose of it in the right way. The presentation was ended by Professor Konstantinos Chasapis who showed slides that depicted the process of producing compost from the organic municipal waste, a programme that is currently in process by the Vari Voula Vouliagmeni Municipality. The students enthusiastically participated in the conversation and judging by their questions and comments, they already have a high level of environmental awareness. The event was part of the “Benefit as you Save” programme in which the Vari Voula Vouliagmeni is lead partner and is funded by the European Union.